Step off the beaten path and head to Black Hills National Forest and Spearfish Canyon Scenic Byway. Change things up with these side-trips from Rapid City: Badlands National Park (in Interior) and Adams House (in Deadwood). Pack the 12th (Wed) with family-friendly diversions at Rushmore Tramway Adventures. There's much more to do: explore and take pictures at Needles Highway, see the interesting displays at South Dakota Air and Space Museum, take in the exciting artwork at Suzie Cappa Art Center, and get in on the family fun at Storybook Island. To see more things to do, other places to visit, and other tourist information, go to the Rapid City day trip tool . Chattanooga to Rapid City is an approximately 6-hour flight. You can also drive; or take a bus. The time zone changes from Eastern Standard Time to Mountain Standard Time, which is usually a -2 hour difference. Prepare for a bit cooler weather when traveling from Chattanooga in June: high temperatures in Rapid City hover around 78°F and lows are around 57°F. Wrap up your sightseeing on the 14th (Fri) to allow time to travel to Glacier National Park. Kick off your visit on the 15th (Sat): contemplate the waterfront views at McDonald Creek, then explore the activities along Lake McDonald, and then trek along Avalanche Lake. Keep things going the next day: hike along Iceberg Lake Trail, trek along Highline Trail, and then explore the striking landscape at Grinnell Glacier. For other places to visit, traveler tips, more things to do, and more tourist information, you can read our Glacier National Park trip website . Getting from Rapid City to Glacier National Park by combination of flight and taxi takes about 7 hours. Other options: drive; or do a combination of bus, shuttle, train, and car. Traveling from Rapid City in June, Glacier National Park is little chillier at night with lows of 45°F. 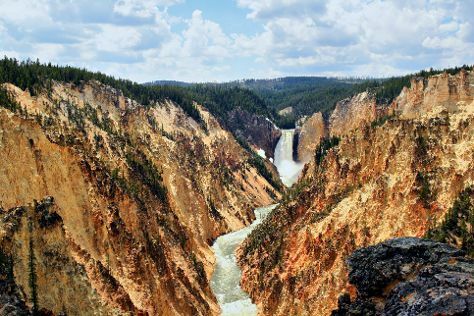 Wrap up your sightseeing on the 16th (Sun) early enough to travel to Yellowstone National Park. Start off your visit on the 17th (Mon): look for all kinds of wild species at Firehole Canyon Drive and then take in breathtaking views at Grand Canyon of the Yellowstone. Get ready for a full day of sightseeing on the next day: take a memorable drive along Grand Loop Road, then witness a stunning natural landmark at West Thumb Geyser Basin, and then take in the natural beauty of Old Faithful. To see reviews, where to stay, other places to visit, and other tourist information, you can read our Yellowstone National Park trip site . Traveling by combination of taxi, flight, and car from Glacier National Park to Yellowstone National Park takes 8 hours. Alternatively, you can drive. Traveling from Glacier National Park in June, expect Yellowstone National Park to be slightly colder, temps between 66°F and 34°F. Finish your sightseeing early on the 18th (Tue) so you can drive to Moose. Moose is an unincorporated community in Teton County, Wyoming, United States, in the Jackson Hole valley. Kick off your visit on the 19th (Wed): take in the dramatic natural features at Inspiration Point, then take a memorable drive along 42-mile Scenic Loop Drive, and then trek along Jenny Lake Trail. On the next day, explore the striking landscape at Glacier View Turnout, contemplate the waterfront views at Jackson Lake, and then take a memorable drive along Signal Mountain Summit Road. To find more things to do, maps, traveler tips, and other tourist information, refer to the Moose online travel route builder . You can drive from Yellowstone National Park to Moose in 2 hours. When traveling from Yellowstone National Park in June, plan for somewhat warmer days in Moose, with highs around 72°F, while nights are about the same with lows around 39°F. Cap off your sightseeing on the 20th (Thu) early enough to travel to Saratoga. Saratoga is a town in Carbon County, Wyoming, United States. On the 21st (Fri), witness a stunning natural landmark at Hobo Hot Pool and then admire the masterpieces at Saratoga Museum. For photos, traveler tips, maps, and more tourist information, you can read our Saratoga attractions app . You can drive from Moose to Saratoga in 5.5 hours. Alternatively, you can fly. Expect somewhat warmer evenings in Saratoga when traveling from Moose in June, with lows around 45°F. Wrap up your sightseeing by early afternoon on the 21st (Fri) to allow enough time to travel to Denver. On the 22nd (Sat), get a sense of history and politics at Colorado State Capitol and then take in the awesome beauty at Lookout Mountain. For reviews, maps, where to stay, and tourist information, refer to the Denver trip planner . You can drive from Saratoga to Denver in 3.5 hours. Plan for somewhat warmer temperatures traveling from Saratoga in June, with highs in Denver at 83°F and lows at 55°F. Cap off your sightseeing on the 22nd (Sat) early enough to travel back home.